My hunch proved correct. 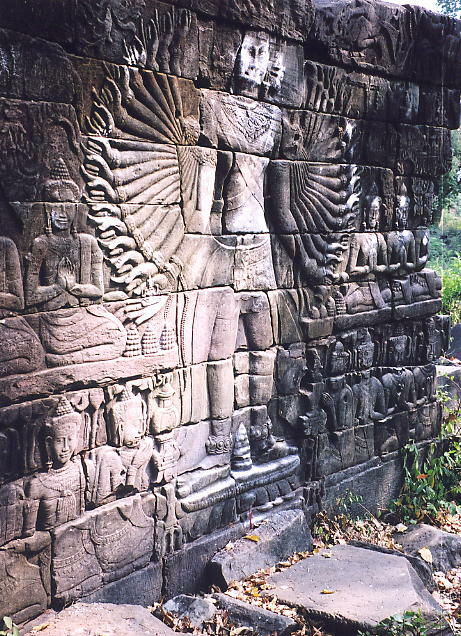 I'd visited the vast temple complex of Banteay Chhmar, near the northwest border with Thailand, once before in 2001, and felt that a temple of that magnitude and importance must have other temples in the vicinity. 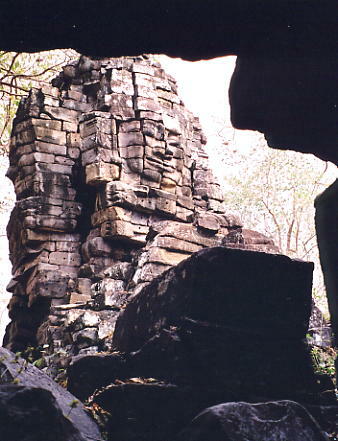 I kept in e-mail contact with my moto-driver from my first visit, Heang, and in preparing for my return, he'd done some investigation at the local tourism office in Sisophon, who'd produced a list of other temple names close to the main site. That had certainly whetted my appetite and I met with Heang for an hour in Siem Reap to discuss our plans for a return visit. Heang had moved to live in Siem Reap a few months before, hoping for a better life as a tuk-tuk driver than in his hometown of Sisophon. His resourcefulness and willingness had greatly impressed me and whilst I spent my last night in Siem Reap, he'd driven his moto the 100kms back to Sisophon to ensure he was ready for my arrival that morning. I'd breakfasted at 6.30am at the HanumanAlaya, packed my bag and met up with Rieng a little after 7am for the ride to the share-taxi rank on the forecourt of the petrol station opposite the main bridge over the river. The taxi drivers quoted a $4 per seat levy for the ride to Sisophon and when Noung arrived with her parents, the car was full and ready to leave. It was 8am. I said my goodbyes to Rieng - who'd had a call to guide a tourist for the next two days whilst I was out of town - and to Noung's parents, as we shared a backseat with two older women, with the driver and two male passengers in front. The highway to Sisophon was busy and bumpy with only one holdup for about ten minutes due to a bottleneck at a broken bridge. The two hour trip gave Noung and I the opportunity to catch-up on her brother's new job in Ou Ambel, close to Sisophon, and her own desire to seek out a job with the same Christian charity in Siem Reap. Heang was waiting at the market for our arrival just after 10am and I arranged to see Noung and her brother Plon later that same evening. Not wanting to waste any time, I booked a room at the Neak Meas hotel ($12/night with air-con and hot water) and we were on the road to Banteay Chhmar within twenty minutes of our arrival. It took us two hours on the dusty road (route 69) to cover the 40kms to Thma Puok, though thankfully the sun was behind cloud for much of the time, and we stopped for a beef and rice lunch at a busy restaurant opposite the police station. 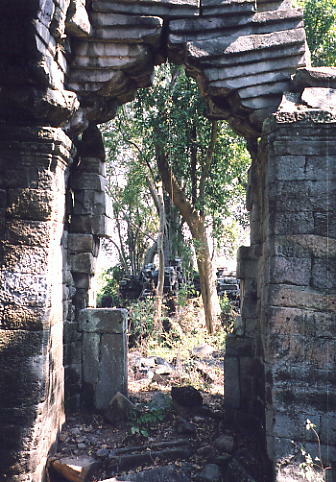 The last leg of the ride took us another twenty minutes, arriving at the entrance to the main Banteay Chhmar temple a little after 1.30pm, signing the visitors book and handing over the $3 entry fee to the solitary policeman on duty. 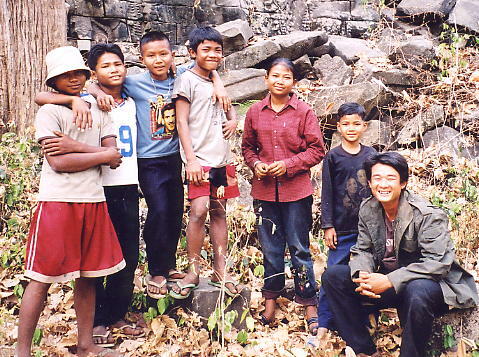 After an inspection of the dharmasala (rest house) near the entrance, a welcoming committee awaited me at the ruined eastern gopura of half a dozen cheeky teenagers, who decided to adopt me for my visit to 'their' temple. The ringleader was the only girl, India ("like the country" she beamed), who was particularly keen to practice her exceptionally wide English vocabularly, alongwith her not so confident friends, Tout, Pranya, Toeuy, Loan and Sophea. 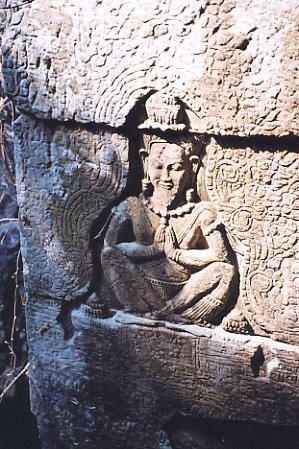 Even though Heang and myself had visited the temple before, I asked my new companions to show me the best bits as we ambled slowly around the temple complex and they picked out a couple of carvings that I hadn't seen on my previous visit. 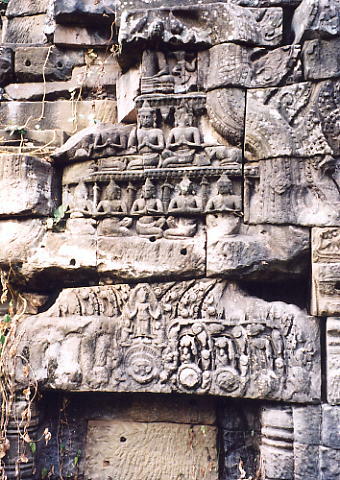 Parts of the temple are in pretty good condition, walls, towers and gopuras are still standing and intact including three towers with the wonderful giant smiling faces of the Bodhisattva Avalokitesvara (or Jayarvarman VII depending on your point of view), some friezes and carvings are also in good nick, whilst other areas are in ruin, large sandstone blocks litter the floor which we used as stepping stones, lintels and pediments are damaged, destroyed and defaced and in the last year, one of the face towers had become unstable, fallen and shattered into many pieces. 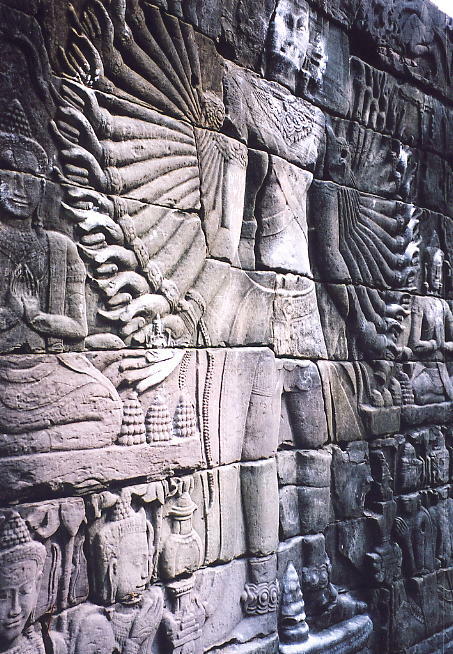 We walked around the outside of the enclosure wall to view the continuous bas-relief carvings, in particular the two remaining multi-armed Lokesvara carvings next to the western entry gopura. 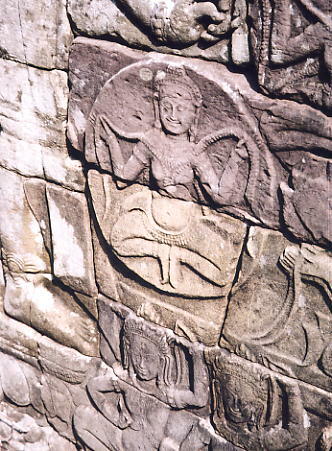 Originally there were eight of these exquisite reliefs though only two, one with thirty-two arms, the other with twenty-two, remain. 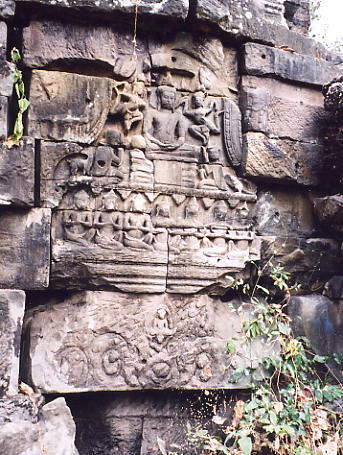 Though they'd survived intact whilst similar carvings nearby had been looted a few years earlier (and now reside in the Phnom Penh museum), both figures had remnants of a white chalk-like substance on them as well as some graffiti in Khmer, whilst further along the wall, the reliefs depicting battle scenes on land and water and a giant Rahu monster were intermittently bathed in sunlight filtering through the surrounding trees. 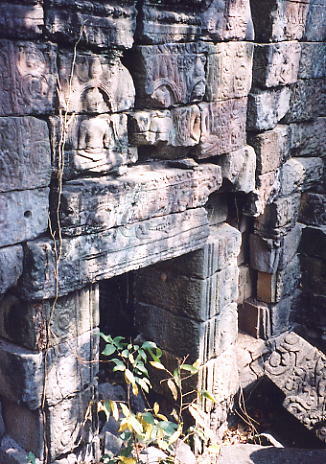 Walking back through the inner sanctuary, the birdcalls and stillness, despite the occasional bout of laughter from my companions who couldn't keep quiet for longer than a minute, gave the temple an undisturbed and tranquil presence, devoid of the crowds and trappings that you find at Angkor. All in all we spent two hours exploring the 12th century site and our new friends eagerly confirmed the whereabouts of up to another eight temples nearby. It was too late to attempt to visit them all that afternoon, so I told them I would return the following morning, which brought an instant look of disappointment to India's face. She explained that she and her friends had to attend school the next day and couldn't meet up with me. A great shame, though I thanked them for their help and gave each of them a tip for their efforts. It was 3.30pm and we had time to investigate just one of the additional temples that India had described, situated a few hundred metres behind the small market area and directly in line with the temple's water-filled moat and southern gopura. 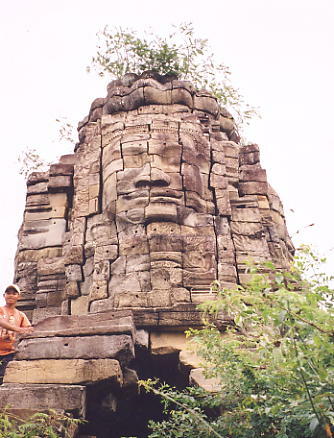 We came to what appeared to be a large pond, where young girls from the village were gathering water in buckets and giggling at my arrival, but it turned out to be a moat surrounding a tree-festooned island where a giant Bayon-style face peered over the treetops. 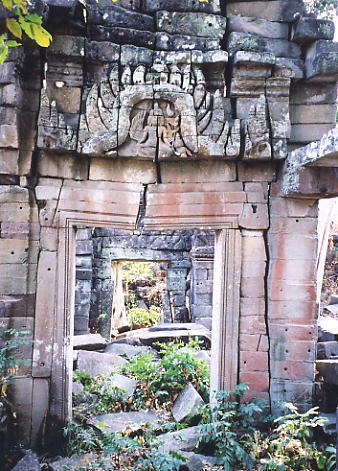 One of the girls called the temple Prasat Prum Mukbuon ('four faces'), another Ta Prohm, whilst Heang said he'd heard both names on a previous visit but had never managed to find the temple before. 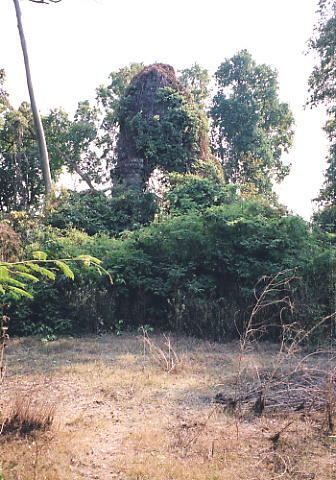 We walked around the laterite-stepped moat until we came to a causeway to the island, where we met four friendly youngsters, three girls, Sary, Chan and Bei, and Sophat, who showed us a path through the dense vegetation to the large tower at the centre. 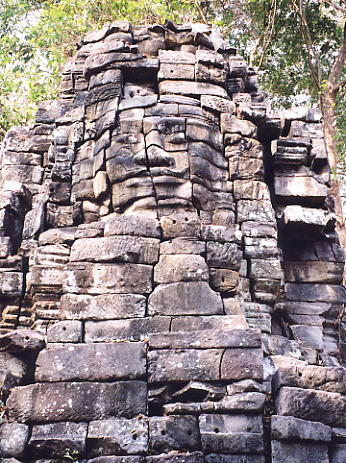 The sandstone structure reminded me of a slimmer version of one of the main gates of Angkor Thom, with four massive faces at the four cardinal points, still in very good condition but lacking any lintels or pediments, whilst a large sandstone pedestal was wedged into a hole in the ground directly beneath the tower. 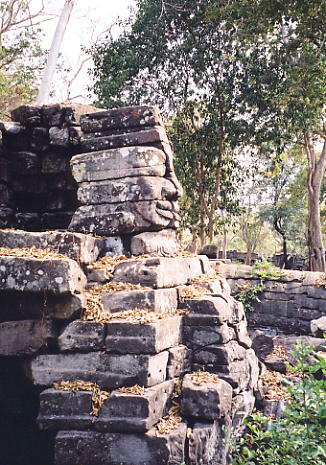 One of the faces had lost its nose but apart from that the faces - carrying a serene expression with closed eyelids and thick, slightly curled lips - were identical to those at the main Banteay Chhmar temple and the others built during the glorious 12th century reign of Jayavarman VII, including the Bayon and Ta Prohm. 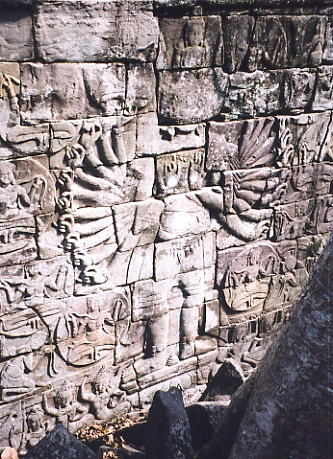 I shinned up to a ledge near one of the faces for a view across the treetops to the wall and moat of the main temple, five hundred metres away. Sary explained to Heang that all the villagers nearby use the moat for their water supplies and as she did one of the girls washing clothes shrieked loudly as she prised a leech off her foot, to the amusement of her friends. 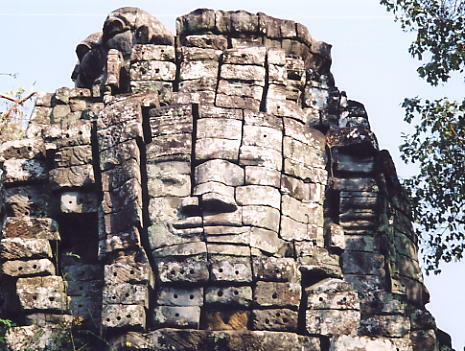 We left Prasat Ta Prohm and its likeable residents at 4pm, buoyed by our discovery and eager to return the following day. 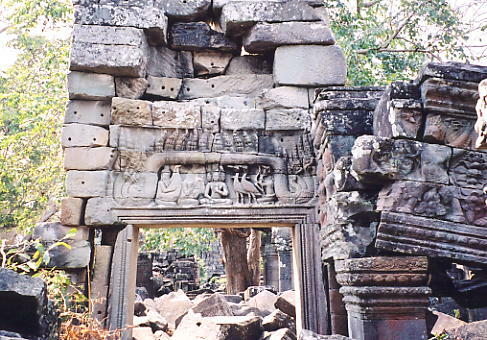 The prospects were good if Ta Prohm was an example of the temples we were likely to find. We called in at a roadside eatery in Thma Puok for a cold drink and some friendly banter with two waitresses, Tein and Neung, whom Heang knew well. Before we reached Sisophon, the sky unexpectedly clouded over and it rained, a snake slithered across the road centimetres from our front tyre and Heang's moto developed a worrying clanking noise. At 7pm Noung and Plon arrived and together with Heang and myself, took motos to one of the popular lakeside restaurants over the bridge and just outside of town on the road to Battambang, for a couple of hours. Accompanied by live music, a string of female singers took to the main stage of the restaurant, whilst we enjoyed a chicken and beef feast in a wooden hut on stilts over the water. The rain fell heavily throughout our meal, which at $12 for a substantial spread and a steady flow of beers and soft drinks for the four of us, was a fair deal. Noung and Plon were staying at the charity's house in Ou Ambel, and I was starting early the next morning, so I said goodnight a little after 9pm, with a promise to see them again before I left Sisophon. Heang arrived at 6.30am the next morning for a noodles and coffee breakfast at a busy cafe nearby and we left for our return visit to Banteay Chhmar a little after 7am. The overnight rain had dampened down the red dirt along route 69 and left small puddles on the bumpy surface as we reached the temple site in exactly two hours. 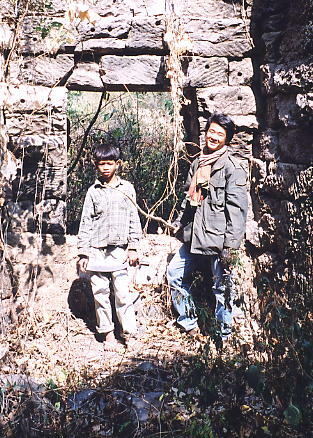 At the entrance, Heang explained our need for a guide to the policeman on duty and moments later his fifteen year old son Sita arrived. 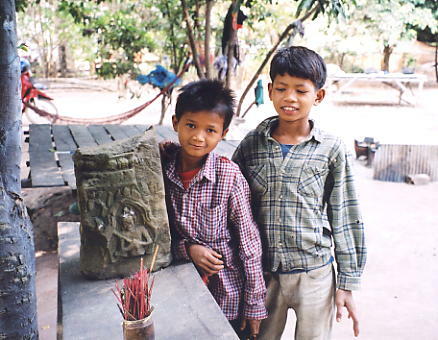 Small for his age, as most Cambodian youngsters are compared to their western counterparts, and a little shy, he knew the whereabouts of the seven satellite temples we'd come to find, the first of which was just a hundred metres directly opposite the east entrance. 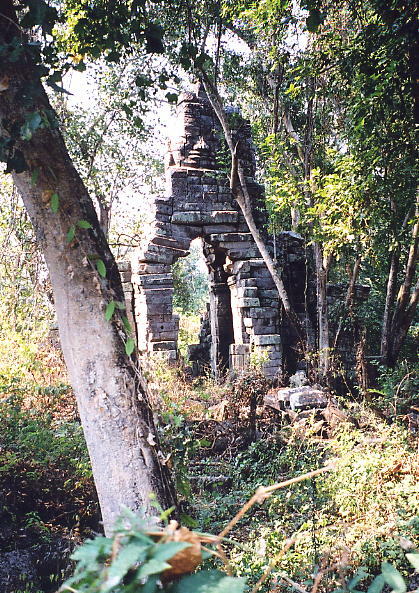 In an overgrown thicket behind some houses, a dry moat surrounded an outer laterite wall and a jumble of fallen sandstone blocks, two badly ruined towers and damaged partial lintels on the ground. 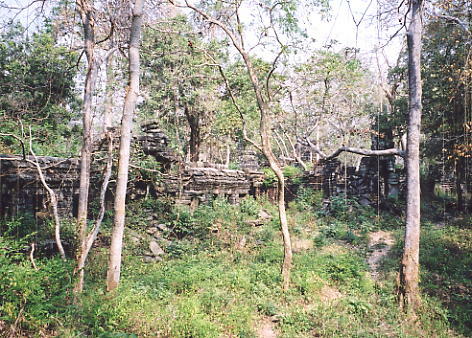 Sita called it Prasat Toch though it was difficult to identify the layout of the temple because of the dense vegetation. 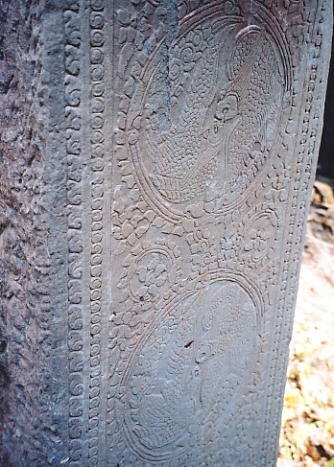 In the garden of the house where we left our moto, we found the base of a carved colonette and then climbed aboard Heang's moto and bounced further eastwards over a series of rice fields and dykes towards a massive baray. 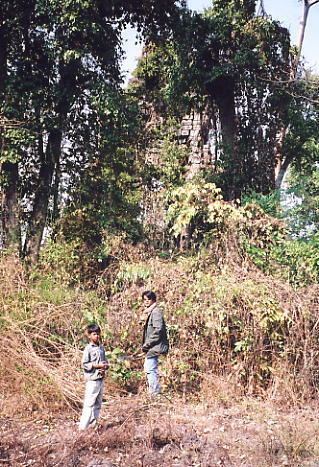 At the top of the laterite-stepped baray wall, we parked the moto at the home of a monk and alongwith two small boys who joined us, walked a kilometre across the dried rice fields to a large island in the centre of the baray. 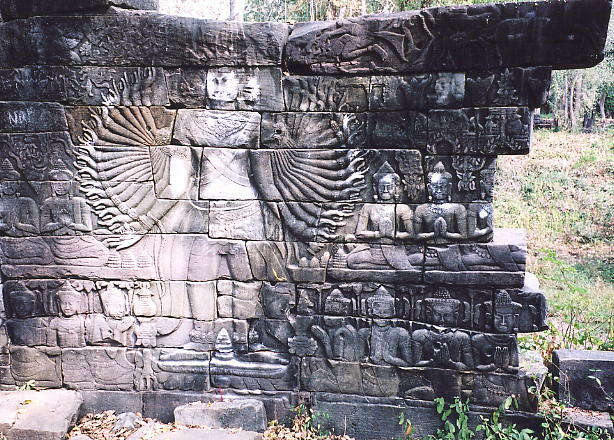 A second circular island within the first contained the temple we'd come to see, Prasat Mebon. 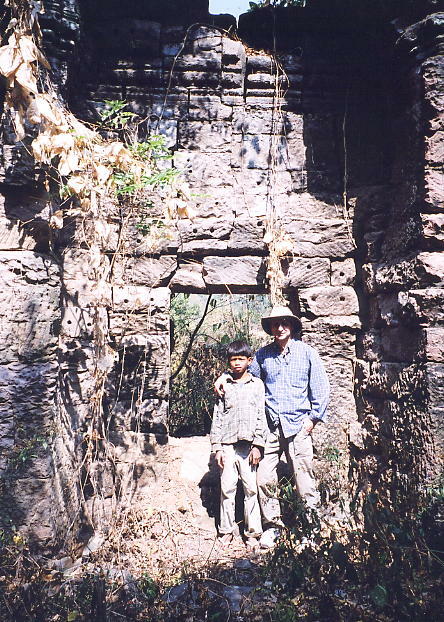 The undergrowth was pretty thick as we reached the first sandstone sanctuary, partly ruined and minus a roof but with some wall carvings of devatas and hermits, and a raised laterite causeway. 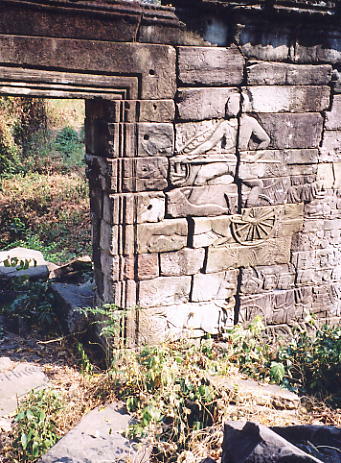 Nearby a larger sanctuary, also sandstone, was in slightly better condition with beautiful circular patterns and Rishis (hermits) carved on the doorframes and a small library amongst the ruins. We returned to the village and stopped at Sita's home to collect a machete. 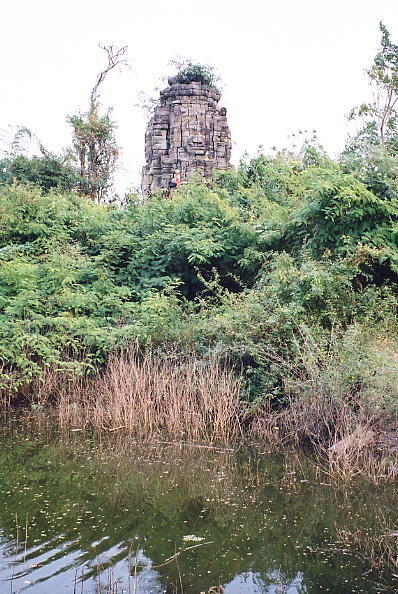 The undergrowth surrounding the temples we'd visited was pretty thick and throny and the blade and the long handle Sita fashioned from a piece of wood he found, would prove to be invaluable. 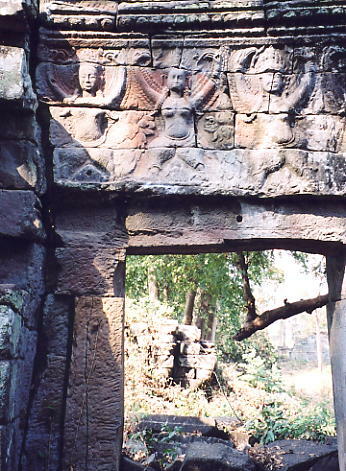 Following the large moat around the main site, we turned northwards and came to Prasat Yeay Pum, another sandstone temple surrounded by a laterite wall, with a small pond, and obvious evidence of theft from the temple, with blocks of sandstone containing the heads of carved Apsaras, missing from the wall. 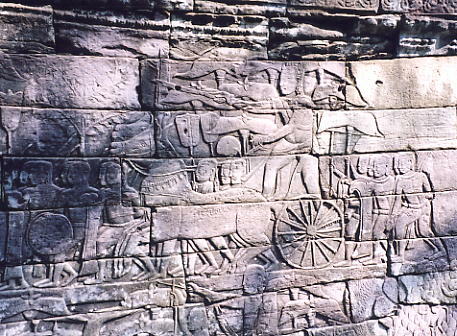 The doorframes contained identical circular carvings to those we found at Prasat Mebon. We continued north for another five minutes and came to a large water-filled moat and a seemingly impenetrable undergrowth-covered island. It proved impossible to cut a way through the eastern approach, as we came under attack from the spiky thornbushes, equally vicious red ants and itchy kha pods, so we tried the western entrance, with more success. After ten minutes of inching our way forwards with the machete, we broke through the thick bush and entered the dark interior, under a canopy of tall trees. Adjusting my eyes to the darkness and to the large tower in front of me, I could make out a giant face. 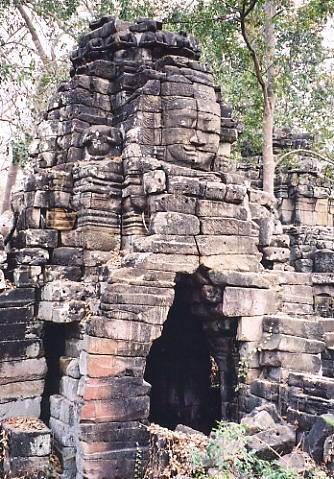 The temple, which Sita called Prasat Chegnchemtrei, was similar to Ta Prohm in the form of its main tower, though only two faces remained, with two sides of the structure having fallen down. 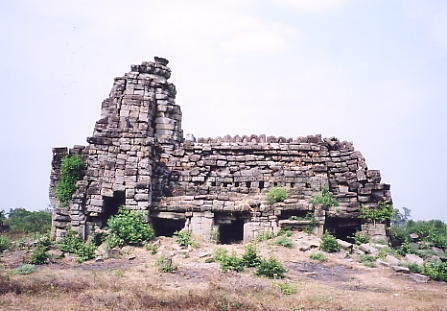 We also found a broken sandstone gopura on the impenetrable eastern side and a small laterite library. It was a difficult temple to photograph clearly and the humidity under the umbrella of trees was uncomfortable, but this was precisely the type of experience and discovery that makes my temple exploration so exciting and at times, challenging. It was 12.30pm, so we took a break and stopped for lunch at one of the food stalls just behind the tiny market by the southeast corner of the main moat. Heang, Sita and myself settled in the shade and ate a beef, soup and vegetables meal, washed down with the energy drink, Red Bull and tea. Refreshed and fed, we carried on through the market in a southwest direction for a few hundred metres. 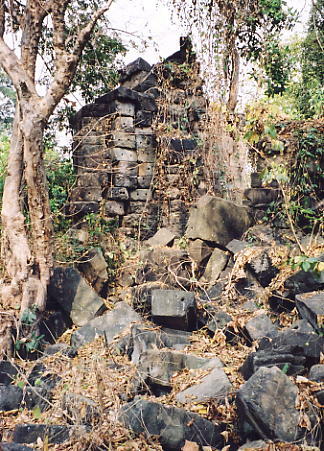 Behind some newly-erected homes and in thick bushes, circled by a dry moat, was a sandstone and laterite temple in very poor condition. 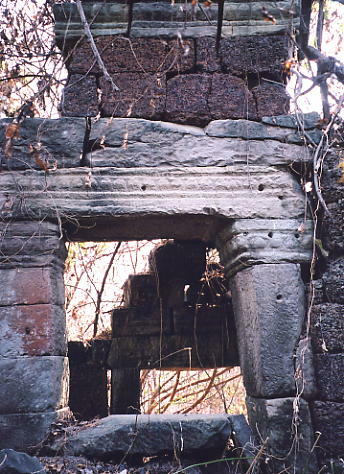 Some walls and doorframes remained standing but little else, with no decorative features that I could find, and no evidence of a tower with faces. 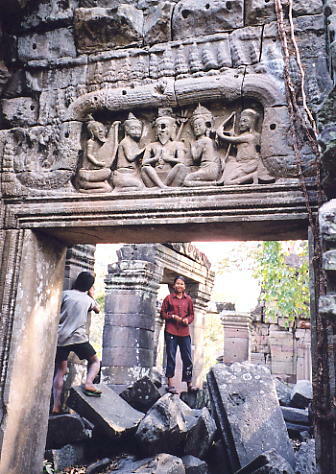 The locals called it Prasat Yeay Chor. 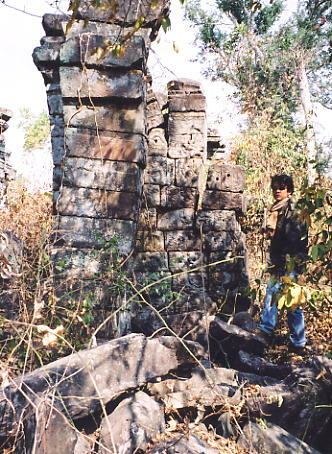 This was the only temple we were to find not aligned to the four cardinal compass points. 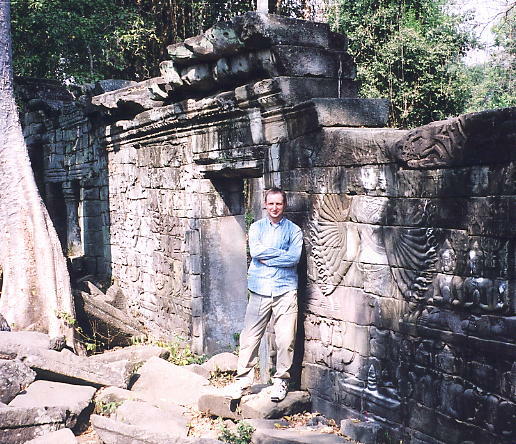 We then moto'd along the south and west sides of the main moat, before turning off and parking our moto behind a tree and walked through fields to see our penultimate satellite temple, Prasat Yeay Chy. 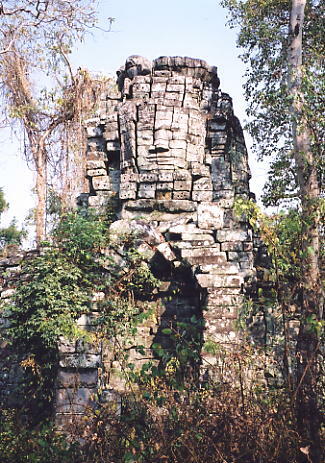 Surrounded by a dry moat, dense vegetation and a laterite wall, this was another large gate tower with the faces of Jayavarman VII on two sides, north and east, but missing from the other sides. 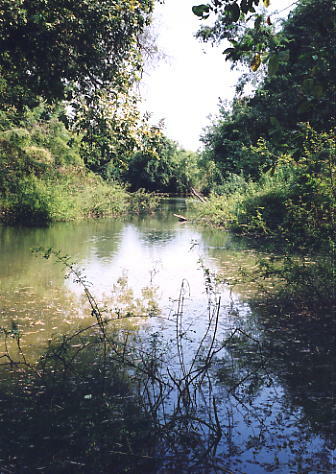 Sita pointed further west through the forest and across more fields and five minutes later we arrived at another moat, this time with water. 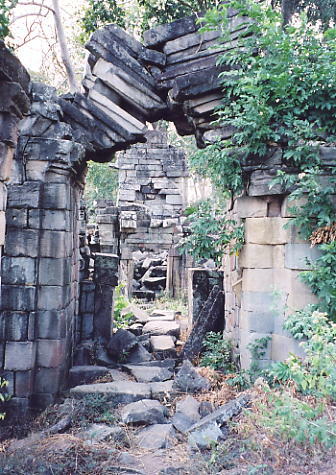 The path into the complex of Prasat Samnang Tasok was fairly straightforward aside from the ferocious red ants, so standing still was asking for trouble. 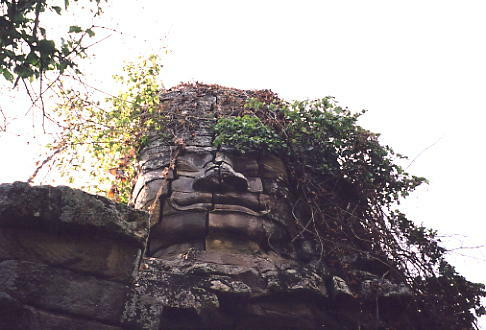 The floor of the site was covered in thick bushes so it was easier to utilise the walls and roof of the outer gopura to make our way to the central sanctuary, which was topped by four more giant faces and other carvings. 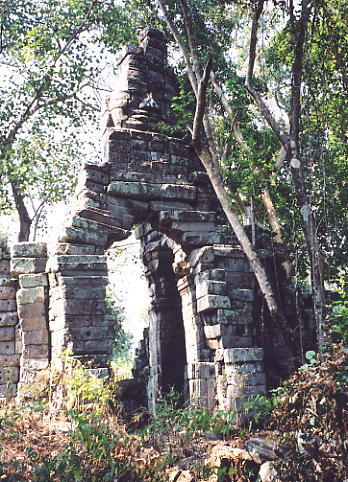 Like the majority of the temples we'd located, apart from the three of us, not another soul was anywhere to be seen and the only sounds we heard were birdcalls and the occasional rustle of a lizard amonst the undergrowth. 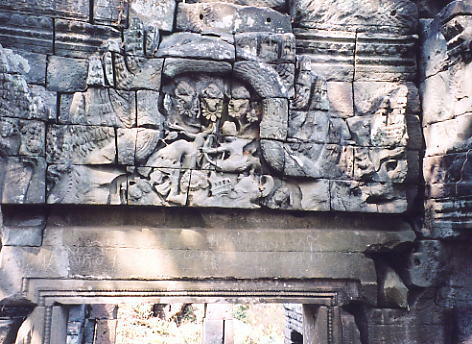 On the way out, I was perched precariously on the lintel of a gateway when two red ants bit into my stomach after crawling up my trousers - I managed to keep my balance, though this final warning from the 'guardians' reminded me that temple exploration has a downside! 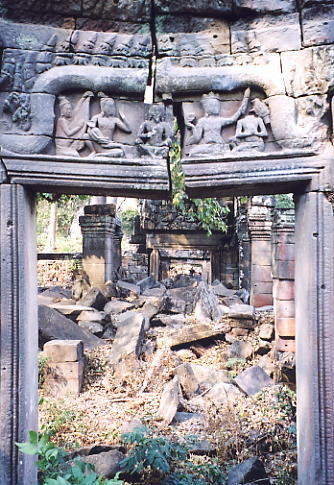 We left at 3pm and stopped at the western entrance gate of the main Banteay Chhmar temple, which was effectively a huge pile of sandstone blocks. Sita met a friend at the gate and left us with my thanks and a tip which he seemed pleased with, before we left the temple for the final time, thoroughly satisfied that we'd uncovered some hidden gems that will make a visit to this important Angkorean site all the more interesting and challenging for visitors in the future. On the return journey, we stopped at Thma Puok to chat briefly with Neung and Tein, before arriving back in Sisophon at 5.30pm. We called into Heang's home, where he used to live with his uncle's family before his recent move to Siem Reap and then we drove out to Ou Ambel, a few kilometres along the road to Poipet, to visit the charity organisation where my friends Noung and Plon were staying. 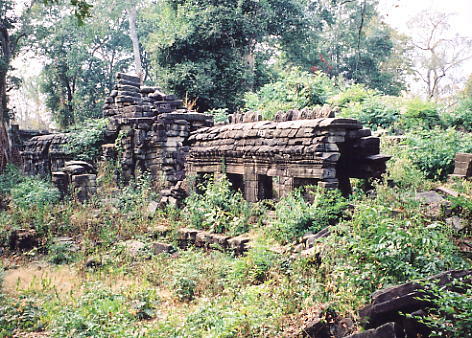 Noung was feeling poorly after travelling to and from Poipet earlier in the day - she's not a great traveller, as I reminded her of a similar experience she had at Banteay Srei a few years before, which at least cheered her up. We stayed for an hour before Heang and I returned to town for a beef and fried rice meal at one of a group of roadside restaurants, where he knew the husband and wife proprietors. At the end of a long though highly successful day, I returned to the Neak Meas hotel by 9pm, thanking Heang for his invaluable co-operation during our journey of discovery. He'd proved to be an excellent companion and driver and I would recommend him to fellow travellers without any hesitation. In the morning, I had breakfast at the Pkay Proeuk restaurant and took a $5 backseat in a share-taxi bound for Siem Reap, that left Sisophon market at 7.30am.